What does a poor farmer in Cameroon do when he wants to modernize his farm? Knowledge in this west African country is passed down from generation to generation but that has limits, particularly for an enterprising farmer. 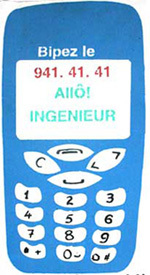 The solution is to pick up the phone and call Allo Ingenieur where an agricultural expert is always on call. "If we can't answer your question on the spot we get back to you," says Marie Martine Yobol, who heads the Documentation Centre for Rural Development in Yaound, part of the agricultural ngo Service d'Appui aux Initiatives Locales de Dveloppement (saild). The documentation centre has got about 7,000 requests for information this year. "If the expert on call can't answer the question then he or she calls a specialist,"
Economist Hozier Nana Chimi, associate director of saild, says "Higher yields require innovation and that requires risk. Farmers often end up taking short cuts that fail. That's why they call Allo Ingenieur." "Sometimes farmers call when it's too late. Then all we can do is tell them to start again. It's not what they want to hear," Yobol says. Around 90 per cent Cameroonians rely on locally produced food to meet their nutritional needs. According to saild, agriculture employs 60 to 70 per cent people in the country, but only 20 per cent of fertile land in Cameroon is being used.